For a web drama that started out surprisingly good, Story of Yanxi Palace impresses until the very end and keeps its place as the number one drama online in spite of competition from Ashes of Love and the newly-premiered Ruyi's Royal Love in the Palace which settled for third on its first week. TV ratings have yet to see any improvement as all shows fall below 1.0% except for Ashes of Love which challenges another series high with CSM52 ratings of 1.5%. The Evolution of Our Love ranks in second with CSM52 ratings of 0.8% and 0.6% on its two channels. Mr. Nanny has replaced the show now that it's ended and continues to rank in second. Last but not the least, Leo Luo Yunxi finally joins Ashes of Love co-stars Deng Lun and Yang Zi on the weekly celeb list. Nie Yuan also makes the list to join his Story of Yanxi Palace empress Qin Lan. 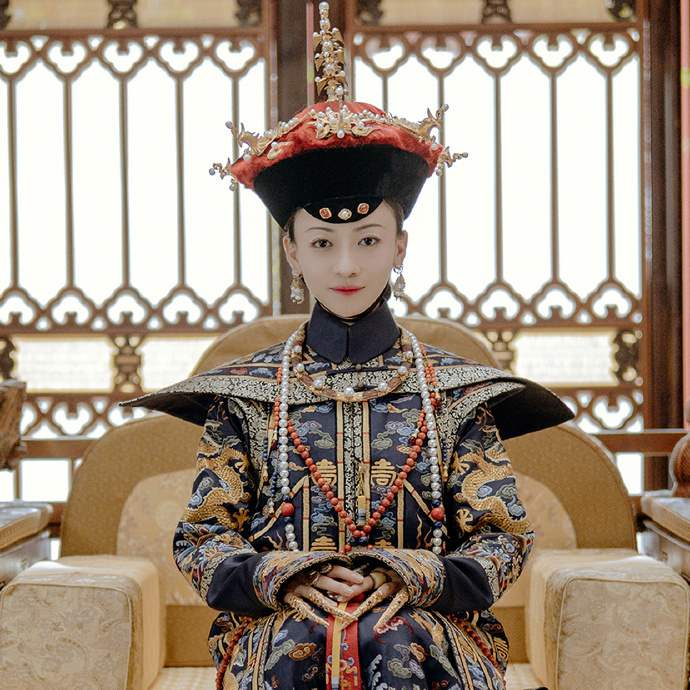 Wu Jinyan should be on here, she's such a regal Empress. I started watching Yanxi Palace last week becauase HSALF is giving me a headache with a lot of demon princess scenes, Night and scrip changes but gotta pick it up again this week since JM already stabbed XF :). Back to Yanxi comment, it is surprisingly good from ep 1. Female lead is so smart and the story is totally focused on the female lead and her journey, we don't have heavy politics involved. It's quite an easy watch. 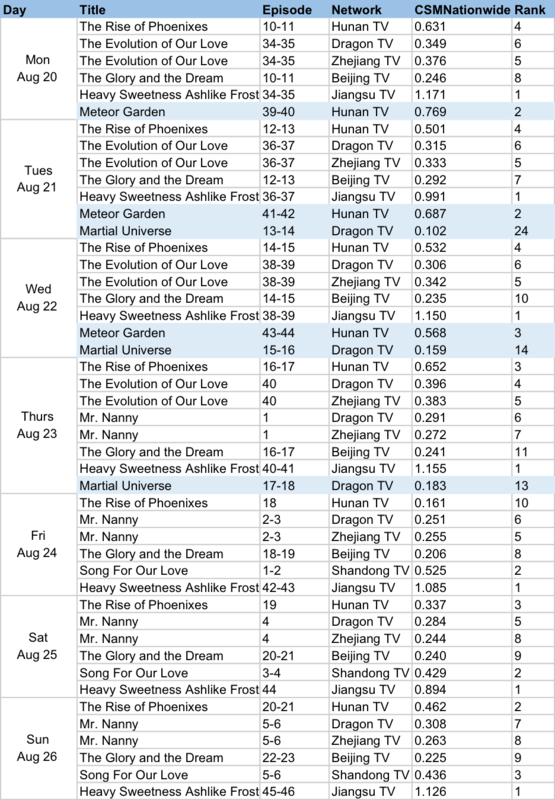 Ratings wise, Martial Universe and Ruyi came out underwhelming so far with the star studded cast they have. I am not gonna follow those two dramas until all eps are out. Yang Yang fanbase is solid and strong seeing how he tops the celeb ranking last week. It's not just fanbase but his boss is willing to pay for all the media play seeing no one cares about his drama. Glad Heavy sweetness ash like Frost is doing well with the ratings. It has the same addicting storyline like TMOPB. I prefer modern dramas so I am just watching Sweet Combat (acting is not that great since it has young actors and young actresses). Those ratings are becoming so meaningless and no longer fun or exciting, because dumb fans are not being fair IMO. They would just rate somebody crazily although they're not even filming or doing anything at all recently. Or, when they do film their products are never good. Zhao liying is another very good example. She is always among the highest top 10 regardless. I was expecting to see new people with better score, for example Qin lan. And Wu jing yan was not even on the list. Sebrina Chen is very talented and beautiful too, heard she's getting to endorse Dior and never on the list. So many more new talents but they just can't get a score because they don't have fans that will be psycho enough.